Looking to capture the flavor of candied fruit, nuts, and spices, the Fruitcake Frappuccino features a Hazelnut Creme Frappuccino blended with dried fruit and cinnamon, topped with whipped cream and a matcha sprinkle and dotted with caramel sauce. The new drink is only available for a very limited time starting today and running through the weekend at participating Starbucks locations in the U.S. and Canada. 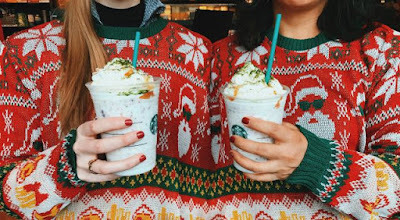 Additionally, to celebrate National Ugly Sweater Day, on Friday, December 16, 2016, Starbucks Rewards members can get a free ugly sweater beverage cozy with the purchase of a Fruitcake Frappuccino, while supplies last.